Thank you for your support of Project Living Hope and the Haitian people. 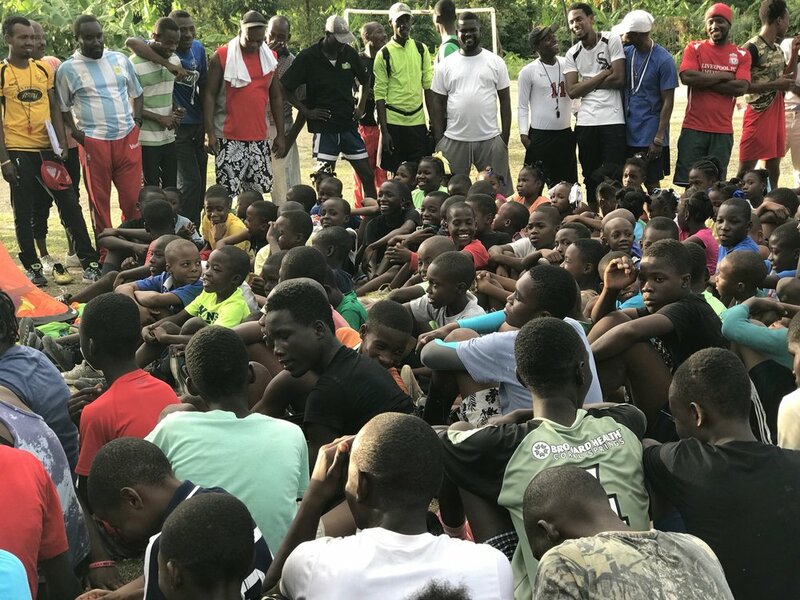 We wanted to give you a brief update about the PLH construction work in Haiti and some of the events that have been happening in the country over the last few weeks. We started the first phase of construction on our property at the beginning of February. Even though there were some setbacks, we had an incredibly successful first week. We will be posting a second blog post with updates about the construction in a few days. We will have some great stories to share with you! Unfortunately, we were not able to proceed with the second week of work due to the continued national fuel shortage and protests that broke out throughout the country. This cut off our supply of fuel to power our equipment and made it difficult for the organization housing our team to power their generators or replenish food and water supplies. We made the difficult call to halt the construction project until things return to normal and brought our excavation team members home to the US. We are so thankful for the work that was completed, the commitment of the volunteers, and the safe journeys home. Haiti has been experiencing inflated prices, fuel shortages, a drop in the value of the Haitian currency, and a lack of confidence in the government. This, along with opposing political parties trying to get back into power, led to 10 days of nationwide protests and roadblocks, beginning February 7th. The people are tired -- tired of living with a bad economy, government corruption, and roadblocks and protests. But it is not the general population that protests in the streets and causes roadblocks. These are mainly young, unemployed men who have been hired to shut down Haitian life to push an agenda. Workers sit at home losing their much needed pay, students miss days of school, hospitals run out of oxygen and other supplies, businesses and stores remain closed, and families run out of fuel, food, and drinking water. Though protests are a common occurrence in Haiti, this last round was more widespread and lasted longer than normal. Things have been a lot calmer this week (though many roads are still blocked), but we are waiting to see if it is just a respite or if this round of protests has died down. We will be assessing the situation over the next week and establishing a plan for the construction project and our upcoming visiting team trips. 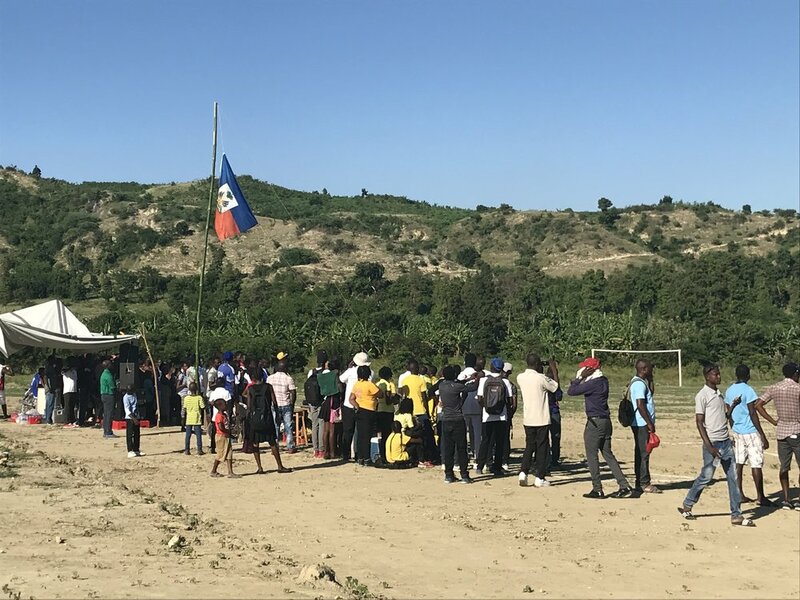 If widespread protests continue, we will not send visiting teams to Haiti as the roadblocks prohibit travel between Port-au-Prince and our community of Camp Marie. The safety of our visitors and Haitian staff is always our number one concern, and we also do not wish for those giving of their time to come down and not be able to experience Haiti fully. We are optimistic that the situation will continue to quiet down and we can resume with the project and planned trips. Our community of Camp Marie and the surrounding areas remained fairly calm. Our staff helped care for our visitors, stepped up as the leaders they are within their community, and continued to move to advance the mission of Project Living Hope. The Haitian people are hopeful and resilient. This is not the first time that they have had to deal with protests, nor will it be the last. In times like these, we see them come alongside and help support one another in amazing ways. We ask you to continue to pray for Haiti. Even when these protests die down and life returns to normal, the issues will remain. There is much to be done in Haiti. When facing these situations, we are reminded that Haiti needs jobs. If these young men had employment, they would not be protesting. Haiti is facing many challenges, but we have faith that God can overcome these and we must faithfully continue the work that He is calling us to do -- to empower the Haitian people to build a stronger Haiti. Thank you for praying with us for positive change and forward movement. Monday, February 25th at Foothills Church in Stayton at 6pm. Dessert will be served. February 2, 2019 was a monumental day, we broke ground on the Project Living Hope property and began the mass grading work that is needed for construction of the King Center! It’s a huge milestone and it’s only just the beginning! Project Living Hope Founder and President Guesly Dessieux, the Dessieux Family, Camp Marie Mayor, Mary Lourdes, the construction team, our Haitian Staff, and dozens of community members came out early Saturday morning to mark the occasion. This is an exciting new chapter and we are so thankful for all of your prayers and support that made this monumental day possible! PLH President and Founder Guesly Dessieux standing on the first location to be at finish grade elevation. We are thankful for the volunteers and champions for giving their time, talent, and treasure. Progress has proceeded well so far. We have a committed and focused team with a great vision, and a welcoming community in Haiti. We have consulted with project managers, engineers and construction professionals. There is approximately 88,000 cubic yards of material that needs to be moved. It has been estimated that it will take two-months to complete the grading and excavation of the site. We have skilled operators from the US working alongside Haitians to complete this project. We have had more than a dozen volunteers commit to the project and it’s been amazing to see God assemble the teams and work out all the many details. We are still recruiting for teams that will be traveling at the end of February and early March. We are specifically looking for people experienced in operating D7 bulldozer, 336 excavator, 966 front loader, roller, and haul truck. We will also need the leadership of a project manager / site superintendent to manage the work, and a surveyor or grade checker to help make sure the grading work is completed according to plan. The trip costs approximately $1500 per person, which includes airfare, accommodations, food and transportation. All travel arrangements will be taken care of by Project Living Hope. If you cannot afford the cost, but are willing to donate your time, we have some scholarships available. If you are interested in being on a team or supporting a team member, please contact us. A ton of planning, preparing, organizing and prayer has gone into this project and we are so thankful for everyone that has helped make this possible! Would you like to give a one-time or monthly gift designated to the building fund? On August 1, 2018 our team departed PDX and began our journey to Haiti. Our team consisted of twelve members coming from all over Oregon. 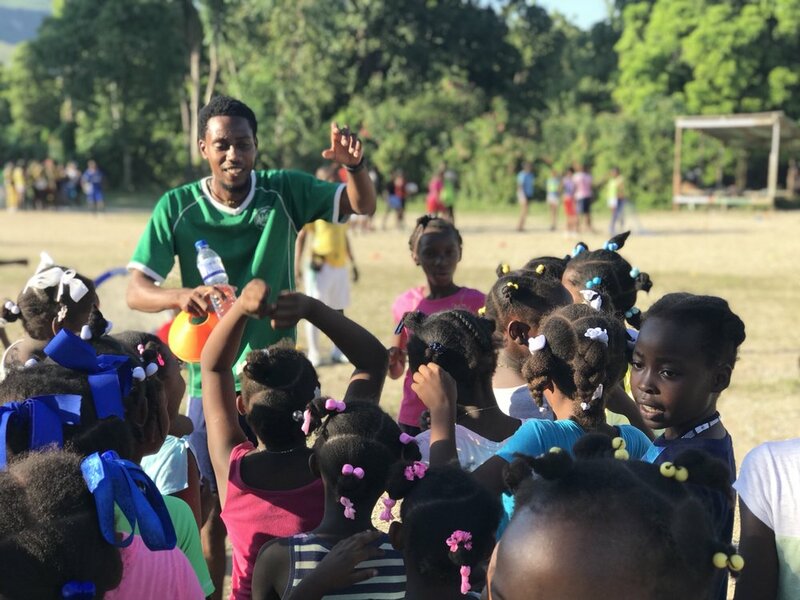 The main purpose of our trip was vision casting and building relationships within the community of Camp Marie, Haiti, the community where Project Living Hope is based. Because we believe Christ intended relationships to be the building blocks for change, we want to be known as an organization rooted in relationships. The first stop on our trip was to The National Museum of Haiti, where we learned about the history and the people of Haiti. Our next stop was Extollo, an organization we are partnering with. We currently have four men from the community of Camp Marie enrolled in their masonry program. We toured the facility and were able to see first-hand the ways they are teaching and empowering Haitians to learn masonry and carpentry skills. We arrived at our guest house that evening. The Ortlip guest house is located 10 minutes from Camp Marie in the neighboring town of Montrouis. It’s a beautiful location and we enjoyed our first Haiti sunset. Day two, Julia began giving violin lessons. The students were eager and learned so much! Then we hiked the PLH property and picked some watermelon to have with lunch! We ended our day with a cooking class. We first shopped for the ingredients in a Haitian market. Then we worked side-by-side with Haitians and learned how to prepare plantains, bread fruit, and pikliz. It was a great experience, we all enjoyed working together to prepare the food and then eating together. It was definitely one of the highlights of the trip! On day three, we attended church in Camp Marie. Pastor Marcel delivered a beautiful sermon on the importance of a strong church - one with spirit-filled leadership, doctrinally sound messages, uncompromising convictions, a strong emphasis on faith and prayer, faithful and generous giving, people who serve in the strength of their spiritual gifts and who value relationships, and a vision for the lost world. The worship was beautiful and our own team member, Julia, played violin with the worship team. After church, we walked into town, visited a few of the PLH staff members’ homes and met their families. We also were able to introduce the team to the magistrate of Camp Marie, Marielourdes. She welcomed our team and expressed how excited she is to be working with PLH. After lunch, we set out for the Olympic Center to watch a soccer game. After we arrived, a tropical storm blew in and the game had to be canceled. It was quite a storm! It even hailed, which is a very rare occurrence in Haiti. The children were running outside and catching it in their hands and eating it. While we didn’t get to see a soccer game, there was no shortage of entertainment. A group of young men entertained us with some street dancing. Day four, our team split up. One group stayed in Camp Marie and the other traveled into Port-au-Prince. Mike and Julia had their second day of violin lessons. The church’s music director was there helping the kids learn and his son took lessons that day. Brad, Walky and Ian took video and measurements of the road. They got to speak with Marielourdes, the magistrate, about our equipment needs and plans for the road. They also got to meet a number of community members who live near where the road will be built. The rest of the team visited GOEX and LIFE SA, two apparel production facilities. We met our operations manager, Thonny Fabien there, so he could see the two companies that make t-shirts and sports uniforms. In the afternoon, we went to a village near Croix-de-Bouquets where a number of artisans make and sell metal pieces made from old oil drums. Day five, half the team went to Port-au-Prince while the other half of the team stayed to work on the road and for day three of violin lessons. The team that stayed in Camp Marie visited Clean Water for Haiti and the PLH property. They were promised that the equipment for the road would be available on the weekend, so the Camp Marie team offered to go talk to the director of ODVA (the department in charge of road building in Haiti) to discuss our needs. While they were there, they worked out an agreement to send a bulldozer down to widen and extend the road to our property the very next day! Praise the Lord! The Port-au-Prince group went to two companies, Haiti Design Co. and Deux Mains. We took an artisan workshop where we got to learn how to make Haitian jewelry. Day six was our last full day in Camp Marie. Before we left for Camp Marie, one of our Haitian team members, Obenson, led our team in a prayer for the road. I think we were all nervous that it wouldn’t actually happen. But, when we got to Camp Marie, the bulldozer was there! He cleared the road while the community members watched and cheered!! Praise the Lord for His plans that happen in His time. All the violin students came together for one last lesson. Two were able to play “Twinkle, Twinkle Little Star” for us. And Julia gave the students a mini recital to show them what they are striving for. In all, the PLH vision trip was a tremendous success. We were welcomed into the community and the relationships that were established further unified PLH and the community of Camp Marie. It was exciting to be a part of this trip and to see God work through our team. We gathered together yesterday, with our families, one month after returning home, to reflect on our trip and celebrate the relationships we established as a team and with the beautiful people of Haiti. We praise God for opened doors that allowed for the road to be built out to our property. Having access to the property is huge and will now allow for soil testing to be done, getting us one step closer to construction! Our soccer teams have been doing well and we just launched our young men’s league on August 12. Our English classes will resume in September and we look forward to expanding into new job skills and sports in the upcoming months. Thank you for your faithful support of Project Living Hope! In 2012, our founder, Guesly Dessieux, started a trip for pre-medical students from Corban University to work with a team of physicians and nurses to provide medical care to underserved people in Haiti. The following year, I was asked to join the leadership team for the Corban trip. In case you were not aware, Guesly is a physician in Stayton, OR and I am a professor in the Science department at Corban University. 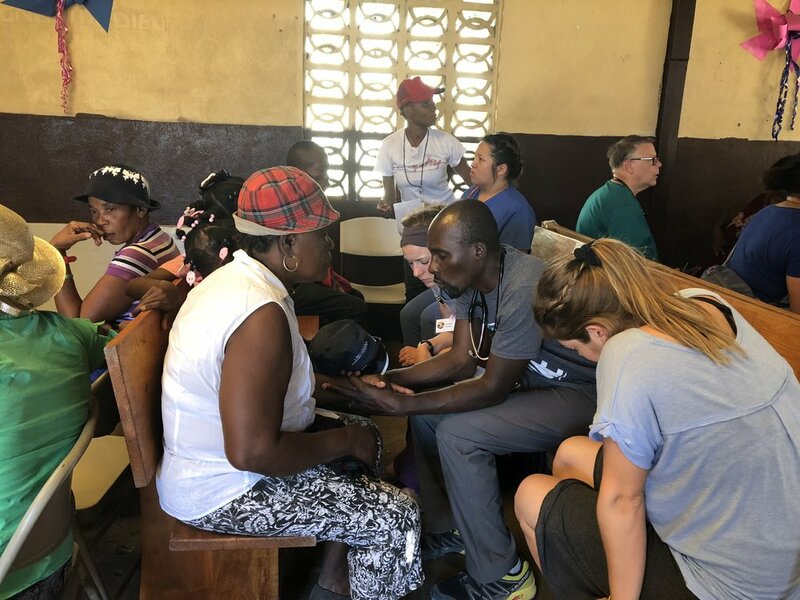 The purpose of this trip is to serve the medical needs of the Haitian people while also providing pre-med students a glimpse of the unique nature of healthcare in the developing world. This trip makes a significant impact on Corban University students; they come back with a renewed drive to serve others through medicine. In fact, because of this trip, Corban University now offers a scholarship in Guesly’s name – the Dessieux Scholarship – for students seeking to use a career in healthcare to serve others through missions. This May, Guesly and I helped lead a team of 15 students and 15 medical professionals to serve on the 7th annual Corban University medical mission trip. We partnered with a new organization, Nehemiah Vision Ministries, to provide outreach in three villages in rural Haiti as well as with our Oregonian friend Aslan Noakes and her organization, Empower Haiti Together, to help develop a hypertension management program in two other communities. We saw over 400 patients and developed relationships with many other like-minded people working to empower the Haitian people. While Project Living Hope does not focus on medical ministry, we are committed to using our talents to empower the Haitian people and we seek to partner with other organizations that are working to do the same. We are excited about the partnerships with these two organizations and look forward to collaborating more with them in the future. While we were in country, we also got to work with our Project Living Hope in-country employees and take care of important logistics. We met with our architect, Andrew Ripp from MSAADA Architects, to sign contracts and to discuss our vision for our project as well as our ministry. Then, later in the week, Andy came out and toured the property. We are excited to be working with Andy and MSAADA. Their mission is to “provide professional architectural and engineering services in the planning, design and implementation of building projects for organizations dedicated to serving others.” Specifically, they seek to partner with organizations in developing countries who serve the Worldwide Church. In addition, we met with another nearby organization, Extollo International, that works to educate Haitians in the construction industry, “equipping them to build/rebuild their communities, reduce unemployment, stimulate the local economy and improve their quality of life.” We will be partnering with Extollo to train construction workers from Camp Marie and contracting with them to help begin building on Phase One. The contracts are signed, so be on the lookout for updates about building in the next few months! Another important meeting to note was that we also got to see the mayor, Marie Lourdes. We are so impressed with the way she is advocating for Project Living Hope and the community of Camp Marie. As we met, she showed us a letter she had written to the local government officials asking for their support as we develop in this new community. She wrote about the opportunities that our partnership with Camp Marie will develop and how their support will help further this relationship and create jobs for the community. We ask you to be in prayer that this letter will be well received and that God will continue to guide us to future partnerships that will help us continue His Kingdom Work. The King Center property that Project Living Hope purchased last Fall is located just a half-mile from Route 1. For all intents and purposes, this is the only passable road between the Northern city of Cap-Haitian and the capital, Port-au-prince. This makes the location ideally situated. The ease of access it has to many major cities will, in the unfortunate event of a disaster, mean we are in the best place to make the greatest difference. When we bought the land, we made an agreement with the farmers and the City that they would carve out a wider, more drivable road between Route 1 and our property. Until this week, there was a just a small footpath leading off the dirt road through the town of Camp Marie to our property. But this week, they started road construction! 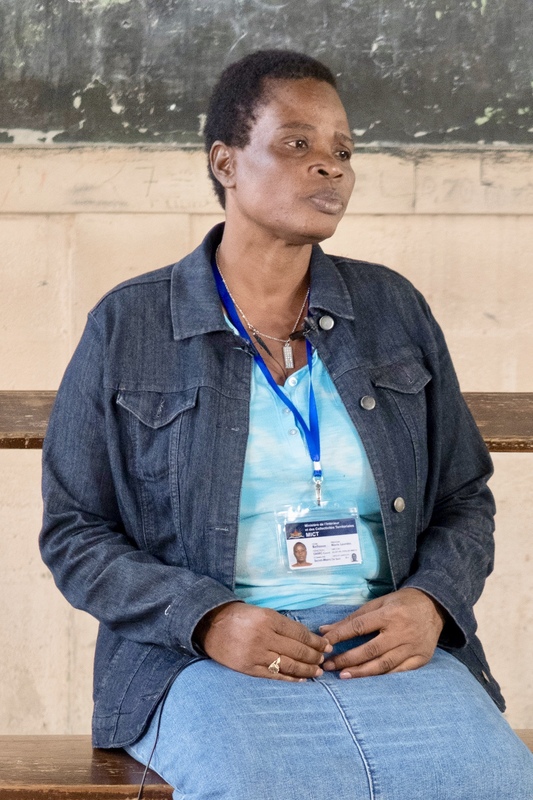 Through her government connections, the mayor of Camp Marie, Marie Lourdes, made arrangements to get the necessary equipment, and the community members worked together to make this possible. We are excited for this new development because we have a construction team heading down in August. We will now be able to get vehicles, large equipment and constructions supplies to our property more efficiently. If you’ve been with us to Haiti, talked to a PLH board or staff member, read previous blog posts, or been to a fundraising event, we hope you see we are taking a different approach to the ministry of poverty alleviation. Where many, well-intentioned organizations fail is that their donations and assistance create a cycle of dependency that keeps the people they are serving coming back for more. There is a time and place for relief aid that provides for the immediate needs of the people we are working with. In the case of a natural disaster or a similar crisis, relief is the right help. To really be successful, however, we must move into a partnership role with the people we are serving. We must focus our efforts on long-term development, rather than immediate relief. Which is why we are partnering with the community members to work together on this project. They are starting excavation on the road, then we hope to bring in professionals that can train them to build drainage and pave the road. Without their involvement, the King Center will only ever be Project Living Hope’s project. But with their efforts, this will be Camp Marie’s project. We are taking the time to build relationships, get to know the strengths and weaknesses of the community members, and work with them to accomplish the goals that are best for them. We are joining their community! We have a construction team going down in August but are still looking for a few more team members. Do you have experience or know of someone who has experience in construction, operating heavy equipment or training others to do so? Our plan for August is to clear a portion of the land that we plan to build on and to start putting up fencing on our property. We would love your help with this. We have a second construction trip scheduled for the first week in December. If August is too soon for you but you would still like to help, consider signing up to go in December. Learn more here. Although the road is starting to take shape, we will need some help making it better. We need to set up a drainage system to make sure that the road stays as dry as possible during the rainy season and we are also considering paving it or adding gravel. Your prayers and support in this regard would be helpful. Do you have skills in this area or do you know of an individual or a company who might be interested in helping us with the road? Email us. Finally, please pray for the community leaders, including the mayor Marie Lourdes. Pierre Descieux, our Director of Operations in Haiti, has been in regular communication with Mrs. Lourdes and other community members. Pray that these relationships will continue to flourish as we work together. Last month, during our trip to Haiti, I found myself once again in front of a group of Haitian students teaching them English. Besides a couple hours last spring, I haven’t done that for more than twelve years but I was thrilled to be back at it. I know firsthand that when we help Haitians learn English, we are giving them an opportunity to be empowered. I taught English in Haiti for two years some years back and I was blessed to see so many fruits from our efforts in that school. Our students went on to get jobs and to help their country. I had one student named Thonny Fabien that we actually just got to spend the week with because he is now Project Living Hope’s Operations Manager! I get excited to think what may come from teaching English in this new community we’re in. PLH’s vice president, Sarah Comstock, recruited her mother, Julie Williams, to join us in teaching English and she was a marvelous addition to the team. Julie has lots of experience teaching English, including eight years in Portugal. She knew just what to do with the students we had who are at the very beginning of their English language journeys. Each afternoon we taught students in Camp Marie. We met for class in a school being constructed at the local church. Students found out about it via word-of-mouth from friends and each day we had more students come. We had invited a third-year interpretation student, Gerald, to join us us for the week. He interpreted for Julie, assisted with her classes and saw how she makes her classes engaging and successful. On the second day, we split the students into two classes. I took the more advanced, but still beginning, students while Julie and Gerald stayed with the rest of the students. I enjoyed seeing how much English my students had already acquired and how eager they are to keep learning. My sister, Laura, who has two years of experience teaching English in South Korea joined me in teaching partway through the week. After four days of class, the students were eager to know what the plan was going forward. I was SO glad we did have a plan. It would have done little good to teach them for only one week and then tell them, well, someday we’ll come back and do some more. Instead, Guesly paid a visit to our classes and explained to them that Gerald would be returning to teach them after we left! They were so grateful to hear that. We have since learned that even more students showed up the following week, willing to pay the small tuition fee we set for a chance to learn English from a qualified instructor. Before leaving the students, we also told them that more teams would be coming and that we’d arrange for them to visit their classes and practice with them. We are still learning about this community and the possibilities it holds, and considering what kinds of training we may want to offer there, but English will definitely be among them.